Suitable for dry and damaged, chemically-treated hair in need of pampering care. Enhance your hair and scalp health with Nunature Argan Oil Deep Repairing Hair Masque that helps to conquer split ends and tame frizzy hair into manageable, radiant tresses. Infused with the main ingredient, Indian Kino Tree Extract known for its powerful anti-ageing properties, this hair masque instantly repairs the five (5) signs of hair damage such as split ends, weak brittle strands, rough texture, dull and dehydrated hair. Strengthened hair is further nourished and revitalised with the benefits of Argan Oil – thus, restoring softness, strength and shine to chemically-treated hair. 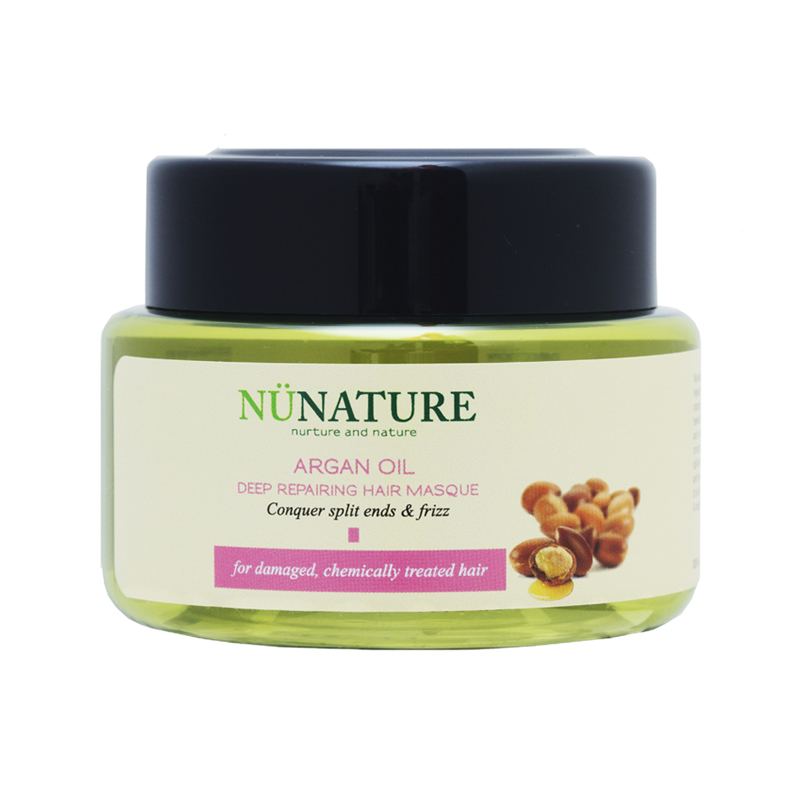 The pampering coat of Argan Oil too works wonders in minimising split ends. The unique blend of natural ingredients in this hair masque delivers significant antioxidant and moisturising properties to restore lustre and elasticity to dull and damaged hair. The final step in Nunature natural hair care solution for completely healthy and hydrated hair. After using Nunature shampoo, rinse well. Apply Nunature hair masque to wet hair and leave it for 5 to 10 minutes. Rinse thoroughly. Does not require heat. Suitable for dry, dehydrated hair in need of hydration and radiance. Rejuvenate your hair with Nunature Avocado Intensive Quenching Hair Masque that instantly infuses moisture into every strand of your hair. Light in texture, this hair masque gives your hair a luxurious respite from harmful environmental pollutants thanks to the combined goodness of avocado, honey and yogurt essentials. Containing the Indian Kino Tree extract, it delivers significant natural antioxidant properties to strengthen your hair and give it a healthy shine. This hair masque transforms dry, dehydrated hair into silky soft and manageable tresses. It effectively replenishes your hair of its natural oils and body for renewed volume, softness and radiance. The final step in Nunature natural hair care solution for completely hydrated hair with a healthy glow. After using Nunature shampoo, rinse well. Apply Nunature hair masque to wet hair and leave it for 3 to 5 minutes. Rinse thoroughly. Does not require heat.